The Essentials pH Meter is a highly accurate, professional meter. Easy to use, water resistant, tough and reliable for a minimum of 365 tests. The Essentials pH meter is the perfect choice for easy, quick pH testing. Complete with sturdy case for storage and protection, batteries and a sachet of buffer 7 for easy calibration the Essentials pH meter is the perfect choice for precise pH testing, simply dip the probe into the solution, stir and allow around 20 seconds for the meter to deliver a reading. This will be indicated by a beep. All pH meters are temperature sensitive. A benefit of the ESSENTIALS pH meter is that it has Automatic Temperature Compensation (ATC), which corrects the reading with respect to temperature. On meters without ATC, the pH should be checked at the same time of day each time in order to minimise any temperature related fluctuations. 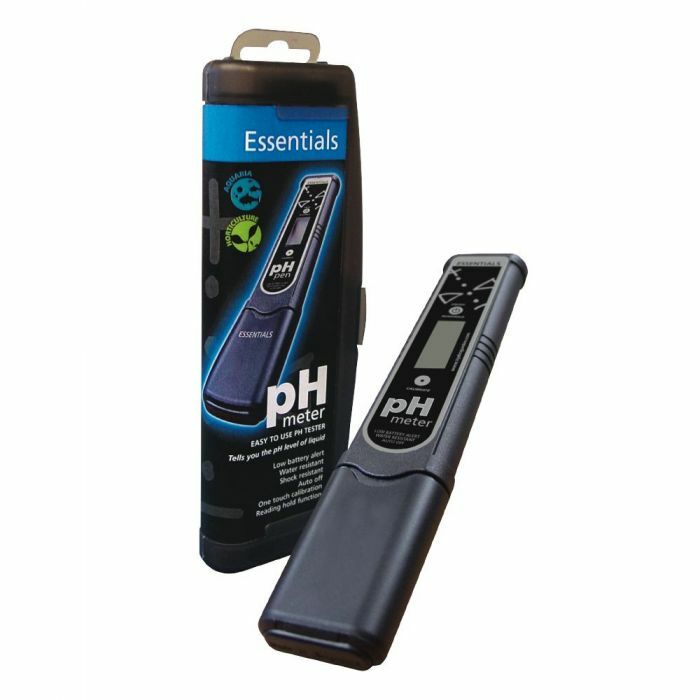 The Essentials pH Meter contains a special probe which measures the pH of a liquid. The end of the meter is dipped into the nutrient solution and switched on. After a short time, the display will settle and pH of the liquid will be shown on the LCD readout. Once a reading has been taken, the display will lock until another button is pressed, giving you chance to remove the meter from the solution and to read the display. The Essentials digital pH Meter is water-resistant but not water-proof so it should never be fully submerged. Calibration is a simple push-button operation and the unit has an auto switch-off facility to preserve battery life. The meter is straightforward to use and has proved to be reliable and accurate making it great value-for-money. To grow plants successfully, particularly in hydroponics, it is necessary to monitor and adjust the pH of your nutrient solution on a regular basis. In general, plants grown in hydroponics like a pH of approximately between 5.5 and 6.5 (plant species dependant) with a little bit of variation within this range. This is because plants can only absorb certain nutrients at a pH close to 5.5 and others at a pH closer to 6.5. If your nutrient solution strays out of this optimum range for too long, your plants will not be able to absorb all the nutrients that they need and will become deficient, leading to slowed growth and eventually sickness. To avoid pH problems, and the plant problems that it can cause, it is wise to check and adjust the pH of your nutrient solution very regularly (every day if possible). Soil grown plants tend to like a pH of around 6.5. A good way of finding out the pH of your soil is to test the run-off water which comes out of the bottom of the pot when you water. It is recommended that before using for the first time, the Essentials Digital pH Meter needs to be calibrated. A small single-use sachet of calibration fluid is supplied with the meter for this purpose. The meter should also be re-calibrated once a week if being used daily. Calibration fluids are available for this purpose. To calibrate the meter, remove the black protective end-cap and wet the probe with clean water. Shake out the end to remove excess water and dip into calibration fluid. Pressing the calibration button will then begin the automatic calibration process. When this is complete, your Essentials Digital pH Meter is ready for use. Before every use always rinse the probe with clean water and shake off the excess. Press the on button and dip the probe into the nutrient solution. After a few seconds the meter will beep, indicating that the pH measurement has been taken. The meter can now be removed and the display read. 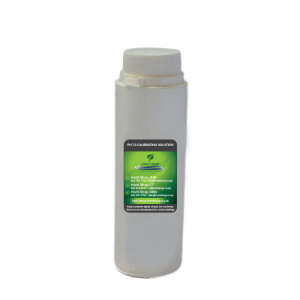 The pH of your nutrient solution can then be corrected with pH Up or pH Down adjustment fluids before re-testing. The meter can be switched off by pressing the on-off button for 3 seconds. Always rinse the probe with water and shake off the excess before replacing the end-cap after use. Warning: pH adjustment fluids are highly caustic and require careful handling and storage. To help your meter last as long as possible, you should add a drop of pH Storage Solution in the cap and store upright (Tip down). The tip should never be allowed to dry out, pH instruments are very susceptible to extreme temperatures and moisture, so always keep them in a cool dry place. If the pH meter is well looked after, it will have a 1-3 year life span.